I’m raw. I feel bruised. The light seems too bright, the noises too near. Today, the fact that this world is not our home is overwhelming. We took our girls, 3 and 5, to a restaurant last night and I felt exposed and fearful. I saw adults look at them with kindness and sadness, and even that made me want to hide them away. I live half a country away, my girls are safe, and I feel traumatized. I cannot fathom how people in that tiny town in Connecticut feel, especially the ones who woke up today to realize that the nightmare of yesterday was real and that their home is truly empty. I ache for them. It is like we are all grieving. And the stages of grief are flowing over us. Denial. 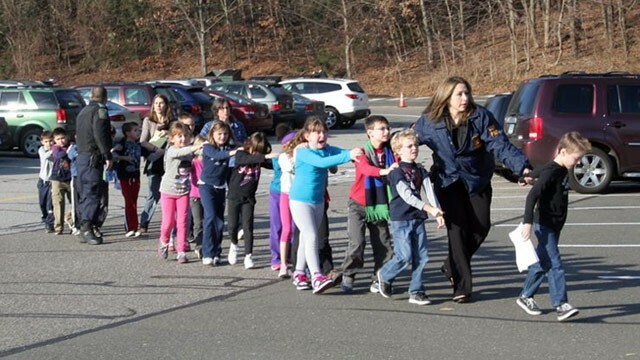 Yesterday I kept praying that the media was wrong, that they’d somehow find the children okay. That a survivor would be found. That somehow this was all not really happening. Anger. I confess – I’m furious at everything. Furious at our enemy (damn you. Your end is certain, and I pray it is soon. Jesus has won.). Furious at sin and the death that has wrapped itself around humanity since the garden. I am READY for its power over us to be OVER. Furious at the killer. Furious that he could get his hands on weapons that are that lethal and quick. Furious at our broken mental health system and the casual culture of violence as entertainment. Furious at everyone who is racing to defend their position instead of putting everything on the table to FIX THIS and STOP IT. I’m livid. I just want it to stop. I hate this fear. Bargaining. I want it not to be true. I keep analyzing it thinking what would have happened if one factor had changed, wondering why and how someone could EVER do this, and even looking at my own kids and begging God to somehow spare them the hurt of this broken evil world. Depression. I can’t stop crying. Yesterday a scary part came on a movie and Bekah curled up next to me and said, “Mom, will you protect me?” and I prayed “Jesus please” as I cried and held her tight. I just keep imagining those rooms and what those babies saw and felt. I see my Grace’s kindergarten classroom in my head as I read the stories and my heart breaks for those parents. How do they go on? I pray and I pray all day and although I want this to lift I know that for thousands in Connecticut this won’t lift for years, if ever. So I pray and I ask the Lord to somehow supernaturally let my sadness ease someone else’s – let me, from afar, bear another’s burden and lift their sadness. That maybe a parent or a family member or a counselor or a first responder or a teacher or someone in that town will be able to breathe today because I felt a little of their weight on my chest. Acceptance. I don’t know how any of us are supposed to ever accept any of this. It is fundamentally against all I believe – life and hope and love and the promise of the future. I am grateful that Jesus drew little kids to himself and I believe that those children are with him tonight, and that gives me a small measure of hope, but honestly even that doesn’t seem enough. So what do we do while we grieve? How do we lift this sadness? Should we even want this sadness to lift? I don’t know. How can we help these broken families? What do we do with this helpless feeling? We’re trying to process and yet protect our kids from even knowing it happened. We are letting each other cry and vent. We are praying with all we know to pray for the families in Newtown. We are holding our kids tight. We are trying to shine light into a world so dark, and asking the Lord to renew our hope even in the midst of this sorrow. I know Jesus is the answer – and I pray that somehow in this people will turn to him and find comfort and hope. We are asking the Lord to return soon, and to give us strength in the meantime. We are worshiping and praying – listening to hymns of hope and strength. We are sad and sorry and just trying to stand despite all of those feelings.